08/01/2013: Windows Phone 8 sales: It's looking pretty good! AT&T have a record breaking Q4, lots of Jelly Bean updates and more! 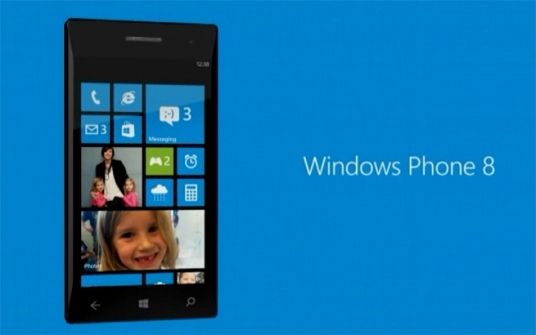 Windows Phone sold 5 times better than last Christmas! WP8 catching WP7 in number of devices in use? After Microsoft's decision not to display at CES you'll forgive us for being taken slightly aback when Steve Ballmer strode onto the stage at Qualcomm's Keynote yesterday. It seems he wanted to offer a brief but interesting insight into the success Windows Phone 8 has had since its launch towards the end of last year! Now that's nowhere near a concrete figure and it doesn't really say that much because we know Windows Phone 7 was not a particularly popular OS, indeed it's supporters raved about the update which brought copy and paste functionality, so obviously there wasn't all that much to get excited about. But, nonetheless if Microsoft has seen five times the activations that is a considerable increase and it does indeed suggest that Windows Phone 8 and the devices it's offered on have been well received, which is good news for HTC and Nokia! There's actually some more evidence to back up Ballmer's words. The guys over at Coolsmartphone have got their hands on some research from AdDuplex which shows how well the new Windows Phone 8 devices have been selling. In the US in particular the market share looks like this, to the right. Given the huge push AT&T have the Lumia 900 when it was launched early last year, these figures look very good for everyone involved! 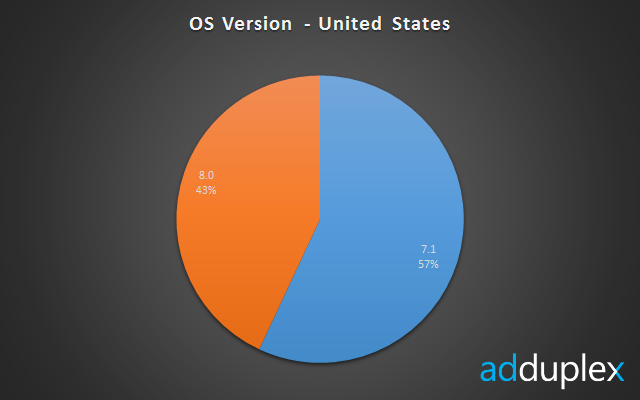 The story isn't quite as impressive in the rest of the world though, with Windows Phone 7 still dominant, but AdDuplex did add that "Last month WP8 accounted for a little over 5% of Windows Phone devices and this month it jumped to 19%. A very substantial achievement" and it's hard to knock growth no matter how limited it is! 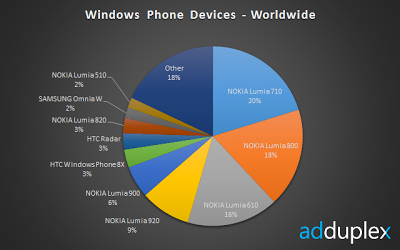 You can see the full list of devices which are currently in use and their percentage in the pie chart below! Coolsmartphone is reporting that the Android 4.1.2 update for the Samsung Galaxy Note II is officially available! Hit that Software update button or connect it to Kies... If you dare risk getting Kies to work for you! SamMobile has detailed the Android 4.1.2 Jelly Bean update for the Samsung Galaxy S2. The update will add many of the features which the Galaxy S3 currently has such as SmartStay and Pop-Up and Play! You can find full details here! AT&T reportedly smashed through their previous quarterly sales record as they shipped 110,000 phones per day during Q4. This added up to sales of 10 million devices, which beat out their previous best from Q4 2011 by 600,000 sales! Verizon have confirmed that they will be selling the Galaxy Note 10.1 soon, but they haven't offered any pricing or time frame for that to happen! We'll update the post as we hear more! Sprint has confirmed that they will be carrying Windows Phones later this year! They said that devices from both HTC and Samsung will be coming to their line-up in the summer! There's no specifics at the moment, but you can check out the full press release in the meantime here! Samsung has officially shipped 30 million Galaxy S3's since the device was released last May! These sales have pushed the Koreans to the top of the Android smartphone seller list and they undoubtedly played a part in shifting Nokia from their position as the biggest mobile phone seller in the world!